T'was Christmas day in the workshop! The rear door has never opened since I bought the car and after removing the door handles, winders and door card, I managed to get it free. It looks like the mechanism is seized, so a replacement from a spare door will be fitted. The panel required to replace the damaged one in the car is no longer available new, so a good second hand one was cut out of an accident damaged write off. The whole car was cut up into sections, (see above) so the panel I wanted was still attached to the transmission tunnel, sill, chassis rails and floor! Below is the panel that will be going into the Mk1. Roll on Boxing Day! November 14th 2010. Green's off the road again! After fitting the new speedo cable to Green on Friday night, my eye caught the gearbox mount and where it bolts through floor. I thought to myself 'What the f***- I mean, 'that doesn't look right'. 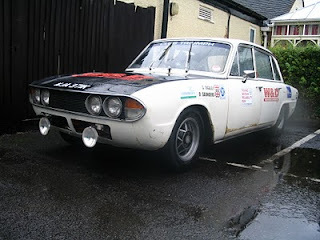 The car was booked for an appointment with a friend (and Triumph guru) on Saturday to sort out its ignition problems, so the gearbox mount would have to wait until Sunday for further inspection. After melting off all the underseal which included smoking out the inside of the car and garage and setting light to my scraper, overalls and hair, I could finally see the extent of the damage. To be fair, its not too bad, just awkward to get to. The surface was rubbed down and left to soak in Genolite rust remover. Welding will commence after I've had a bit more practice and feel confident enough to do it. With this area treated and left, I started work on the rest of the car. The first real long test drive on Saturday had revealed a vibration at 55-60 mph (possibly propshaft) and 'clunking' noise from the rear, (one of the four UJ's worn) and a leaky differential. Both driveshafts were removed, along with the propshaft, and the differential. As it stands at the moment, the replacement diff is has been fitted and the propshaft and driveshafts are on the workbench ready for fitment of new UJ's. All in all a very good days work. Driving this car home from Colchester was great on Saturday after it's tune up and with its 2.5 engine and HS6 twin SU carburettors it just made me think that I need this kind of power (and a bit more) in the Rally car. I have a lot of the parts to make a good 2.5 engine apart form the 2.5 engine block itself! Time to look on ebay methinks! Green now resting on axle stands alongside Yellow. November 7th 2010--A three car day!!!! Work finally started today on 'Yellow'. After a severe battle with the wheel nuts on the nearside rear, I was finally able to get the wheels off and start the dismantling the brakes. This was after bending a wheel brace, breaking a pry bar, demolishing a socket and a sh*t load of swearing! The wheel cylinders were, as I suspected, siezed solid with only one of the four pistons moving freely. Before work started on yellow﻿, I had been working on Green, my Mk2 estate. It's now actually capable of making it out of the garden and onto the road and a test drive proved quite successful. (Surprisingly!) I think it needs some proper tuning of the SU Carburettors and possible different needles, but this is beyond my know how, so it will be farmed out to someone else. It was nice driving her again though. Even the overdrive worked!!! Just a few little jobs now to make her complete and I have a 'parts collector' again! The end result is now additional lighting that can be powered up without blowing everything else, descending us into total darkness and sending us disappearing down a ditch! 17th October 2010. Post RBRR Repairs! The 2100 miles we ended up doing for the RBRR were handled well by the car, although I had started to notice a 'droning' noise around Sunday morning heading across to Dartmoor from Bude in Cornwall. The first place I looked at was the propshaft, although it had had new UJ's and been balanced and should have been ok. The new UJ's were fine, so the slide mount was then re-packed with fresh grease and the differential was topped up with oil. Were we now good? Were we b*llocks! A test drive over to Harlow on the Saturday night proved that we wasn't! Sunday afternoon, while Dave was fitting relays to the Spotlights (We had to disconnect these at the start of the RBRR as they were drawing too much power and would have burnt out the full beam switch-We took action before 'Lucas' The prince of darkness did it for us!!!) I decided to check the rear hubs and rear wheel bearings. I discovered that the drivers side was fine, but the passenger side had movement. Not a good sign! So the nearside drive shaft was removed and scrutinised. With the driveshaft removed and clamped in the vice, it was discovered that the cap that houses the rear bearing (the black circular bit under the two large nuts)﻿ could be moved by hand. This indicated that we had indeed had a bearing failure and would be where the 'droning' noise was coming from. Unfortunately, changing the bearings on these is somewhat impossible without the proper tools and a bench press. Luckily though, I had another driveshaft in stock with new bearings in, so that was fitted instead. 6th October 2010-CAC is alive!!!!! I've been off work this week on annual leave and I had already decided that I need to get CAC (763J) drivable again! This car was on the road until Christmas 2009 when it decided to overheat big time and sieze its engine on the way home from the Club Triumph Essex Christmas meal. It nearly made it home, but siezed about 200 yards from my house. So the girlfriend at that time and I pushed it the rest of the way and into my garden. (She wasn't impressed in her high heels and party dress!) The car started again the next day after it had cooled down, but serious damage had been done by then and all sorts of clatters and rattles were coming from the engine! Due to other projects (Building a double garage) and lack of funds, the car was then parked up for a while until the garage and other stuff was out of the way. The first weekend after Easter, the garage was up and the estate was reversed in and work started pulling the engine and geabox out. I had decided to convert the car to manual overdrive while it was having major surgery, (I dont like auto's) so the parts list was drawn up and all the required bits were gathered. I got to the stage where I had put another engine & gearbox in, but then for some reason, I lost all motivation on all of my cars for a few months and did nothing at all. Then though, the realisation set in that I had to prepare the rally car for the Round Britain Reliability Run, so once again, the estate was put on the back burner. Well, after months of preparation, Friday 1st October 2010 finally arrived and we made our way down to the start point at The Plough Public House in Crews Hill, Enfield. Our spirits were high, if slightly damp by the constant downpour that had been with us all day. It also spooked us a bit that the first song that came on the radio when we got in the car was 'Road to Nowhere' by Talking Heads! 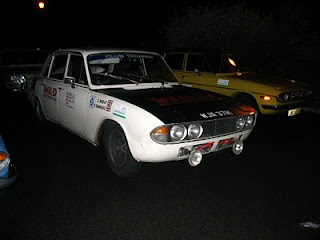 After a few hours in the pub catching up with some old faces and meeting plenty of new ones, the start time arrived and 109 Triumphs gradually left the car park to begin the 2000 miles to be covered in 48 hours. We headed north up the A10, then eventually onto the A1 (and the rain was still falling!) for our first control point at Blyth services near Doncaster. The next stop after this was at 2am at Edinburgh Airport. We had it pointed out to us that our brake lights weren't working, so after discovering a wire that had come off the brake light switch, it was put back on and we continued. Skiach services on the A9 north of Inverness was out next stop, where we stopped for a quick coffee and Petrol (Again!) then pressed onto The Seaview Hotel at John O'Groats for a well deserved breakfast at 8.30 am. After Breakfast and a check of the Engine oil and wheel nuts, we then headed west to Thurso, before turning left onto the B871 and heading down toward Dingwall. The Conon Bridge Hotel was our next stop where lunch was on offer, and so after devouring that we then headed down past Loch Ness and down towards Fort William. After Fort William we then tracked back across the A82, past Ben Nevis and to the Saturday tea-time stop at Stirling. Apparently, this throws the 'first time' crews into panic as they realise that they are still in Scotland on Saturday evening and still have to get all the way down to Lands End and back up to London Yet! Only a minute stop at this one, then back out into the darkness to pick up the A40 and head back towards Monmouth. We then picked up the M4 and headed back over the Severn Bridge from the Welsh side and onto Gordano services on the M5 for the next halt. This was a 45 minute stop and was much needed as by now it was 3.30 Sunday morning and we were on our second night without sleep! The run down the M5 and then A30 towards Bodmin was probably the worst weather I've ever experienced! The rain was so hard, it was bouncing back up at you, and the gales were smothering us in wet leaves and trying to blow us off the road! We carried on undaunted and arrived at Lands End at around 8am. A quick U-turn at Lands End saw us head back up the A30 to Scorrier for another well earned breakfast at 8.43am. After checking engine oil, all fluids and wheel nuts we set out for the next halt at Bude Museum (11am). There was a good display here from the organisers who had also planned a classic car show at the same time. It was quite a sight to see Triumph after Triumph pouring in and one old boy was heard to say to his mate 'I wonder where they've all come from?' If only he'd known! After sorting out some sparking issues (with the help of Andy Pearce and 'Shedtune') we pressed on to our next halt at Badgers Holt at Dartmoor (12.25pm) A quick wash and change of clothes in the toilets and we were off again to head for Dorchester and across to the halt at Pimperne. (2.50pm) This was a village hall and the ladies from the local Women's Institute supplied us with tea & wonderful cakes. Very much appreciated by all as well! All in all, a tiring, but fantastic weekend. We had some great times and met some great people! The car was absolutely brilliant as well. The poor old girl was hardly ever switched off, but just kept going and going. She looked so dirty and tired at the finish, but she's had a good tidy up and clean since then. A big thank you to all that supported and sponsored us! 22nd August.2010. A bit of comfort!!!! Since I've owned the Rally car, it's never had a carpet in it. It's never bothered me to be honest. (mainly because if it hasn't got a carpet, it never needs to be hoovered!) However, due to the impending 2000 mile run coming up and the fact that we'll be living in the car for more than 48 hours, I thought that a bit of comfort might be in order! There was also another reason though. Currently on order is a 'full sport' exhaust system. this system only has one back box at the rear and is significantly louder than a standard one. With this in mind the thought of the new mega-decibel exhaust resonating through the car while one of us is trying to sleep was slightly off putting. 7th August 2010-The Differential's out! Again!!!!!! The RBRR is the 'Round Britain Reliability Run' for Club Triumph being held on the first weekend in October 2010. It's an endurance run where we have to cover 2000 miles in a weekend. We have to average at least 40mph non-stop for 48 hours to cover the mileage required. Sleep deprivation, snacks, high energy drinks and a reliable car is the order of the day! The fact that there's only '60 days' to go (56 at time of writing) has thrown everyone into sheer panic as 60 days translated into the 1 day every weekend that most people have to work on their cars, is not a lot! I also need to replace the seal on the oil filter adapter as this has decided to leak as well. (Only my cars make the decision to leak from both ends at the same time!) So as soon as I have cured this issue, I can test drive the beast and make sure I am leak free! A day at the Seaside!! The second part of the run took us once again through the back routes of Billericay, Hanningfield, Gt Wakering, and finally Southend. Arrival at Southend found us being led into a closed off section of the car park and main road at Westcliffe where the cars parked up and occupants enjoyed a stroll along the sea front. There was also a few stalls and a DJ as well to keep the crowds entertained. The weather was beautiful and it was a good day out with a nice relaxed atmosphere, some lovely cars and good company. I'm looking forward to doing it again next year. Although hopefully in a Triumph! Since buying the brown estate I've had to put to put up with 'wobbly pedal syndrome'. I had the same thing with the Mk1 estate I used to own too. It tends to happen when people convert automatic cars to manual and rather than change the whole pedal box, just fit manual pedals to the existing auto one. The problem being there is a difference in size on the auto & manual brake pedals where they hang from the bar that connects them to the pedal box. The manual pedals therefore need to have metal bushes fitted to take up the slack. without these bushes fitted, the pedals have room to move about and feel decidedly 'wobbly'. So, seeing as there was nothing on TV and I was bored sh*tless on this particular Saturday night, I decided to head out into the garage and crack on with the job. Its a reasonably easy job, but an awkward one seeing as it requires lying across the passenger and drivers seat to get at the bolts for the pedal box. I removed the steering wheel for better access and also found myself having to remove the speedo cable and a heater hose to make life easier. Two hours later the job was done and the car no longer feels like the pedals are going to fall off every time you brake or dip the clutch! Success! The four metal bushes that were required. I've had an overdrive issue lately with the Brown estate. The overdrive works fine when cold, but wont kick in when the car's warmed up. A few people suggested it could be the valves and filter in the overdrive sump clogged up, so I removed them and cleaned them all out. I also managed to destroy the gasket while I was taking off the sump so I need to order one of these on Monday. I also robbed a solenoid switch off of another gearbox I had laying around as I strongly suspect this could be the issue as well. I'm now considering using this car for the Round Britain run in October instead of the rally car, (More room to sleep in the back of it!) so I need to get all of the outstanding issues sorted. Other jobs consist of: Changing the pedal box, (It was converted from an auto set up to manual, but they didn't use spacer bushes, so the pedals are wobbly!) fixing the handbrake which is non-existent on the off side, finding out where the 'knock' is coming from on the offside front whenever we hit a pot hole or bump up a kerb, and maybe fit power steering. 2000 miles in a weekend with no power steering is just not funny! Sunday 18th July 2010 started with a 5am alarm call ready to leave Essex for 6am. We arrived at Bovingdon Airfield at around 7.15am and started preparing the car for scruntineering. With that out of the way we did our final checks and preparations and the autotest started at 9am. My Rally co-driver & navigator Dave Saunders was using my car for this event too, so the car wasn't going to get a chance to cool down much! Bearing in mind that this car is still fitted with a bog standard 2 litre engine and has only had a strut brace, anti-roll bar and lowered springs fitted, it was coping quite well. At the half way stage I was in joint first place with a Triumph 2000 Mk1 with a fast engine and a well 'set up' suspension. Dave was struggling a bit at first it has to be said, but then Dave doesn't know the car as well as me, plus I think he was being a bit conservative with it not being his car. As the day progressed we both got a bit sleeker and faster and Dave got his times down from 1 minute 25 seconds on the first run down to 1.04 on his last, while I managed to get from 1.08 down to 60 seconds point 58 on my last run. We both enjoyed the day a great deal and will be definitely be entering again next year. Our overall results were 4th in class for Dave and 2nd in class for me. Saturday 11th July 2010. One of the hottest days of the year so far and this was my view of it for most of the day. I was underneath my Green Mk2 estate refitting the exhaust, propshaft, clutch slave cylinder, and also discovering the differential had decided to relieve itself of its oil all over the back part of the garage floor! I have no idea why as it was fine when it was reversed into the garage the week after Easter and hasn't turned a wheel in anger since! I also discovered that the ignition wiring has failed somewhere along the loom and the indicators have appeared to go on strike action! Whats wrong with this bloody car??? Does it not want to go back on the road?? Anyway, I had now run out of time with this car as I had to get on with a few other small jobs to get the rally car finished and ready for the club Triumph Autosolo at Bovingdon next Sunday. The car will be driven round a layout of traffic cones in the fastest possible time, so another set of wheels & tyres have been prepared. Because of the amount of wheel spinning that'll be going on, the tyres will be shredded by the end of the day, so it's best to take another set just to use for the autosolo, then change back onto good tyres for the drive home! Of course this also means taking a trolley jack, wheel brace and in my case, another set of wheels nuts as the two sets of wheels I'm using are totally different. Anything loose inside the car also needs to be secured or removed due to the speed the car will be flying round the course. After all, we don't want to be hit in the head by a flying fire extinguisher do we? Looking at the entry list on the website there seems to be 55 entrants! Some work done at last! After weeks of doing absolutely nothing due to losing motivation, I finally booted myself up the arse and made myself get out in the garden and work on the rally car. My co-driver and I are entered in the Club Triumph Autosolo event at Bovindon airfield on July 18th. The event will consist of thrashing the car round a load of traffic cones in the quickest time, so a small suspension upgrade was called for. I already have two other cars in the garage, so I had to do the rally car outside. The timing was pretty good really, because just after I had finished the job and put the front wheels back on...it started persistently raining! All I need to do now is find some motivation to fix the two in the garage!!!!!! Due to severe corrosion, it was stripped for spares and the remainder sent for scrap. It was a real shame because these cars are becoming quite rare now, but this was sadly beyond economical repair. It did yield plenty of useful parts though including: Engine, gearbox, differential, power steering, anti-roll bar, PI Clocks, PI 2-speed wiper system, 2 rear doors, interior, petrol tank, two good bumpers, tow bar and five good wheels and tyres. 16/5/10. Green Mk2 estate almost done! The engine and manual gearbox are now in place in the Green estate. In fact, if I'm honest, they have been for a few weeks now, but due to a combination of extra work shifts, other cars, illness and just general idleness, I haven't got any further. I have a quiet week planned this week, so a couple of hours work a night should see it running by the end of week. Its only been in the garage since the weekend after Easter, but it's amazing how much dust has settled on it in that time! I very nearly pushed it out of the garage and washed it yesterday, but never quite got there! Must get motivated!!!!! The overdrive problem turned out to be where it had been connected the wrong way round at the gearbox end by the previous owner! One this has been resolved, we were back to our 'six gears' instead of four!